When looking for a domestic heat exchange unit for your house it’s really easy to get confused. What with every manufacturer telling you that their system is the best and telling you all about their “unique” features. So here’s a list of some of the most important features or aspects to consider when looking for a mechanical ventilation and heat recovery unit. Most manufacturers make a range of units suitable for different installations from single bed flats right up to large detached houses. The small units just move smaller volumes of air than the larger units. Once you have your plans drawn your supplier will be able to calculate how many litres of air per hour the system will have to move in order to comply with Building Regulations. By using a heat exchange unit that’s sized correctly you can run it at its optimum speed without stressing it and reducing the risk of noise. There are several grades of filters available and the two main types you’re likely to come across are G rated (coarse) filters and F rated (fine) filters. G rated filters will not perform as well as F rated filters. (Read more on the filters available here). This is often referred to as the most important thing to consider before deciding on whether a mechanical ventilation with heat exchange unit is suitable for your property. Typically it’s suggested that heat recovery and ventilation systems are recommended for properties with an air change rate of 3 (Or less) ach (air changes/hour) at 50 Pascals. The reason for this is that if your ach rate is higher than 3 the energy required to run the heat exchange unit is more than the energy saved by the heat recovery unit. However there are people who would suggest that you really need to achieve an ach rate of 1.0 (Passivhaus standard is 0.6) to make it worthwhile. That said you may not get a choice as it may be a requirement of building control that such a system is installed to provide adequate ventilation. Besides there’s more to these things than pure energy efficiency, you also need to consider air quality and comfort within your home. When designing your home it’s important to realise that a designed air tightness rate will typically be lower than the actual air change rate that you’ll achieve once the house is completed. So don’t assume you’ll hit the rate that's been specified at the design stage. If your home has lots of air leaks i.e. 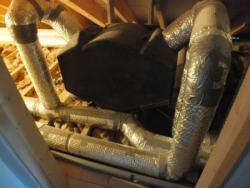 uncontrolled ventilation, you’ll end up getting cold fresh air in through these “leaks”. 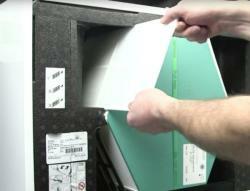 Air leaks effectively bypass heat exchange unit. As this cool air makes it’s way into your home it causes the air temp in your home drop. So instead of working with air inside your home at say 21°C, air leaks or uncontrolled ventilation may cool this to 20°C. So now your heat recovery unit doesn’t have as much heat to recover from the air as it would have, if the air leaks weren’t present. Over time the filters in your unit will remove particles from the air and so the resistance within the filters will increase. So if the fan is running at a constant speed, as filters slowly start to clog up, less air will get through the filter. The constant volume function allows the fan to automatically increase its speed as the filters start to resist the airflow. That way the volume of air provided by the system remains constant throughout the year. The alternative to this is simply to make sure you change your air filters regularly (your heat recovery unit will let you know when). If you end up with less air going through the system your home will not get enough ventilation and you could start to see condensation, black mould and begin noticing smells etc. This is dictated by Building Control and once you know the dimensions of your house it will be possible to calculate how many litres of air will need to be moved per hour. Then during the design phase the supplier will design the duct work in conjunction with the sizing of the main heat recovery unit to provide this amount of air movement. The running costs will come down to how much power the fans in the unit need to run. This again will vary with each house as the length of the duct work and the number of bends will affect the load on the fan unit. Your supplier should be able to tell you what the annual running cost of the entire system should be once the complete installation been designed. As the air temperature increases and passes a certain level air is diverted around the heat exchanger. But make sure it doesn’t bypass the filter as you’ll probably want the air to be continuously filtered even in the summer. Most manufacturers will have 3 speed settings(basic, standard and increased) which will be used via a boost function to increase or reduce the amount of ventilation required. These are typically switched on via the control panel, a switch connected to the bathroom light switch or a humidistat. Make sure the controls are fully explained to your during commissioning. Most suppliers of mechanical ventilation with heat exchange units are typically rated in the region of 90% - 95% heat recovery. But you need to remember that these are lab tested and once you add your uniques series of ducts, bends and vents etc you are unlikely to achieve these figures. Plus the higher your air tightness score (i.e. 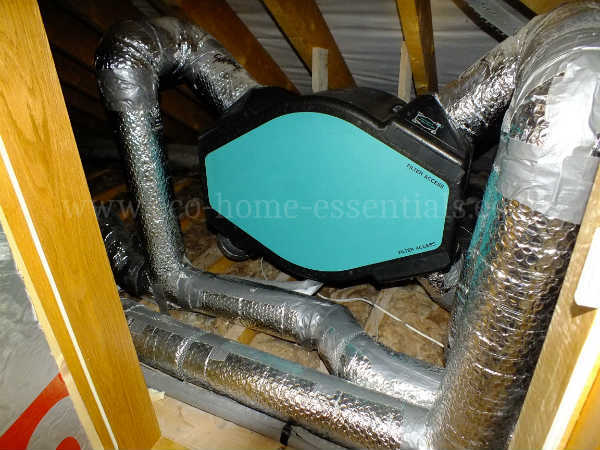 the more air leaks your home has) the less efficient your MVHR unit will be. Ideally you should be aiming for 3 air changes per hour or less (the lower the better). Any ducts running through cold areas must be insulated to a satisfactory standard to prevent condensation occurring within the duct work. In order for your heat exchange unit to work effectively there should be a free flow of air between rooms. That way when air is pushed into a dry room, such as the living room, and extracted from a wet room, such as a kitchen, there can be a free movement of air between the two rooms, creating good cross ventilation. This means providing vents in the walls or doors or leaving gaps beneath the doors to allow for this air movement. Typically it’s recommended that you have at least a 70 cm² opening per extract diffuser (so a 10mm deep gap below a standard door would suffice, but it can’t be partially blocked by carpet etc.). In other words the air coming in should equal the air going out. That way you don’t create a negative or positive pressure situation. Negative pressure could cause fumes etc. to be sucked back into the house from an appliance or open fire (N.B. if you’re trying to create an air tight house you shouldn’t have an open fire!). If you do want to have an open fireplace in your home you’ll need to create a separate vent through the fabric of the building to supply it with an adequate supply of fresh air. Tumble dryers and extractor hoods will also require ventilators so their inclusion should be designed so that they are not affecting the air tightness of the fabric. The system should balanced by the installers or suppliers when commissioning (see below) the system. They should balance the fans on both sides (input and exhaust) of the unit and balance all the vents/diffusers throughout the house by using calibrated anemometers. 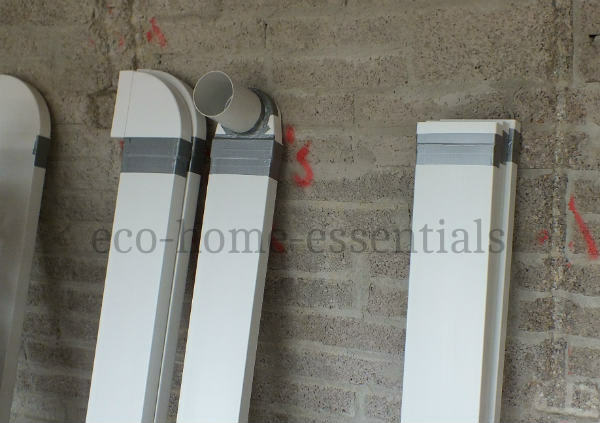 Ducting should always be designed specifically for heat recovery systems and will either be rigid or semi-rigid. Joints should be minimised and where present they should be fully and correctly sealed. The last thing you want is a system that’s noisy, so try to locate the main fan unit away from quiet areas like bedrooms etc. Kitchens are ideal as there are usually other noises in this location meaning your less likely to notice it if it does occur. 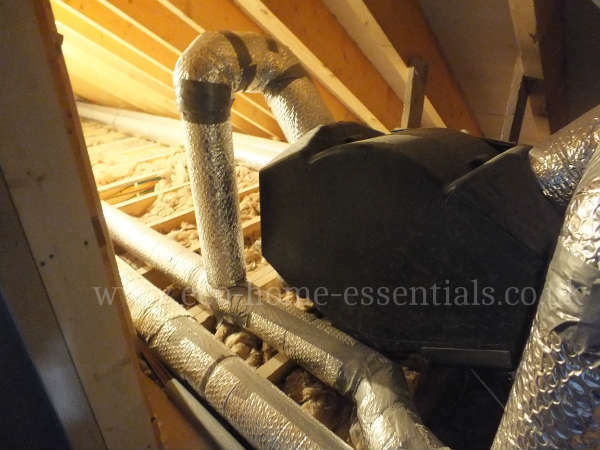 Sound deadening should always be provided on the inlet air and extract air connectors on the house side of the main fan unit to stop noise being transferred to the ductwork. 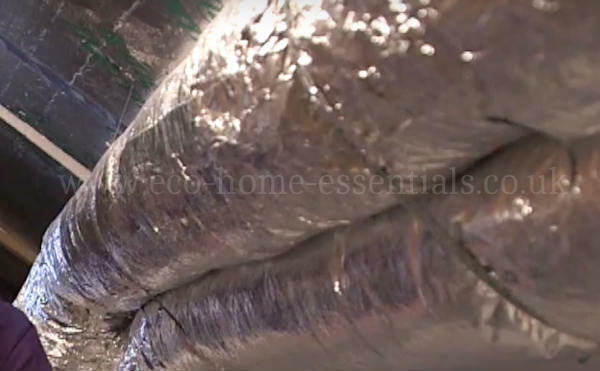 Sound deadening can also be fitted between the ductwork and diffusers in each room. When you extract warm moist air from a property and then take the heat out of it, at some point as the temperature of that air will pass dew point meaning the moisture will condense. This is designed to happen in a specific location within the heat recovery system and at that point it is collected in a condensate trap where it can ruin off to a drain. This condensate waste needs to be frost protected so that it will not freeze and block the pipe in cold conditions. 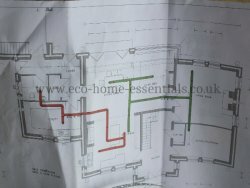 If the condensate pipe is to be routed through cold areas it will also need to be insulated. These are therms that you'll hear mentioned, but what do they mean? Pretty much all of the main suppliers are SAP accredited, this means that they units have been tested and certified with an efficiency figure for use in SAP (Standard Assessment Procedure) calculations. However you might also see some with Passivhaus certification and you should note that Passivhaus uses different methodology when assessing efficiencies so the figures may seem lower, but they’re more accurate. For example a SAP rating may suggest a system is 90% efficient but Passivhaus may say it’s 75%. So make sure you’re not comparing a Passivhaus efficiency rating with a SAP rating. Commissioning is essential once the system has been installed. The supplier, fitter or an independent specialist should balance the entire system and confirm that it is performing to the levels it was designed to achieve. When installing any type of heat exchange unit in your home its essential that you get a specialist to design the system correctly and get them to install it. That way they have no excuses when the system is commissioned if it is under performing or excessively noisy. If you were to fit it yourself you are just leaving yourself open for the blame if it doesn’t perform correctly. 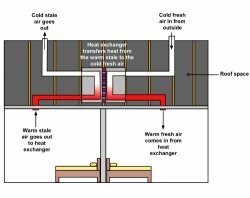 An introduction to heat exchange units. Are all heat exchange units Equal? What could go wrong when fitting a heat recovery System? Home Page. › Heat Recovery Units Intro. › Heat Recovery Features to look for.